We are sure that all of us want to have a lovely and clean bathroom because it would be nice to have a private time in a clean area. But aside from being clean, a nicely designed bathroom would even be better. Well, of course, bathrooms like this would be expensive but the comfort it can give you would be worth it. So, we will show you the bathroom collection from MOMA Design. The company was founded in 2000 by Ignazio Di Masi. 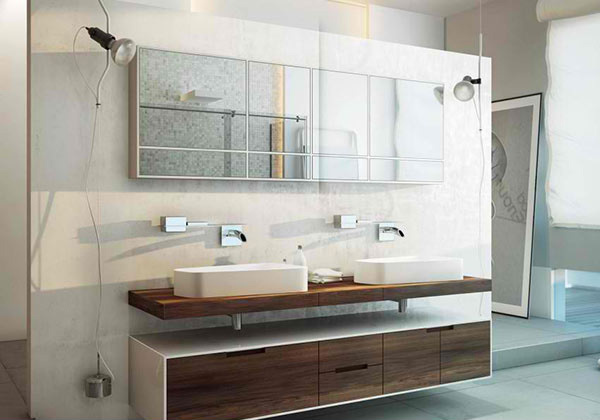 MOMA Design is an Italian brand synonymous of pure design in the bathroom furniture world. It is an exclusive manufacturing company that combines innovation and research with the typical Italian savoir-faire, and it offers a wide range of prestigious products directly to its retailer’s network. You’d surely love the bathroom designs from them! We know your attention was drawn to the big picture on the wall but take note of the sleek bath tub too as well as the shelving on the side. We just love artistic look of this modern bathroom especially the typography wall art as well as the painting. Adding black stones to it give it a subtle Zen vibe. The shower area is very lovely and it appears that it could surely give one a different level of relaxation while showering. That wall art is minimal in design but sure is stylish. It looks perfect in this bathroom charmed with a nice bath tub from MOMA Design. This is the vanity area of the bathroom. Its combination of wood and white is gorgeous. Another bathroom that exudes with elegance and sophistication especially that those candles are everywhere! 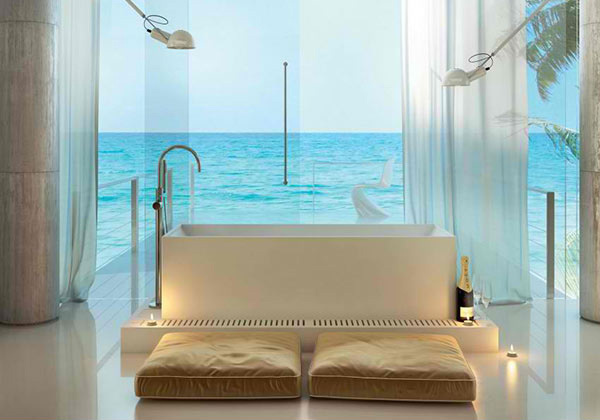 This romantic modern bathroom has a tufted chaise lounge where one could simply relax and unwind. Aside from the white bath tub in this bathroom, it also has some furniture too. The glass wall brings in natural light to the space. Now that is art! Very creative paintings sit in this bathroom which is also adorned with sleek white jars. 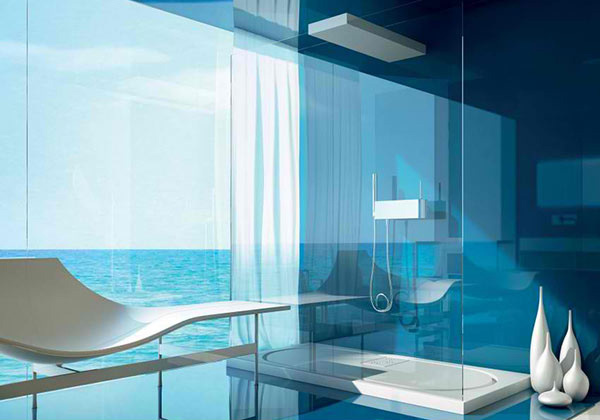 Once you are in this bathroom, you will feel like you are bathing in the ocean because you can directly see it from the glass walls. A bathroom needs to have storage areas to keep everything in order. 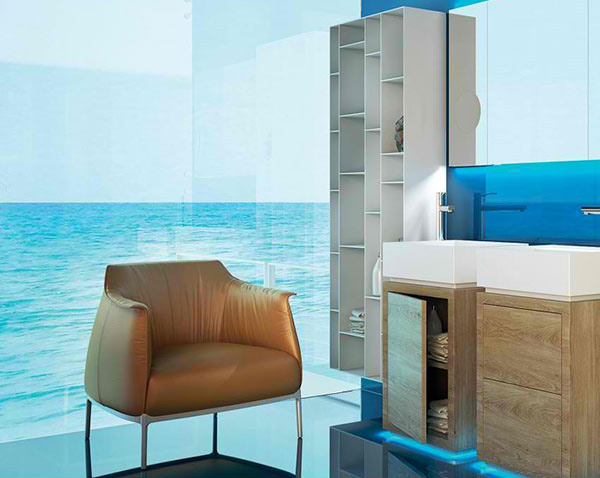 The blue color of this bathroom seems to extend the beauty of the sea. The white streamlines furniture looks perfect here. 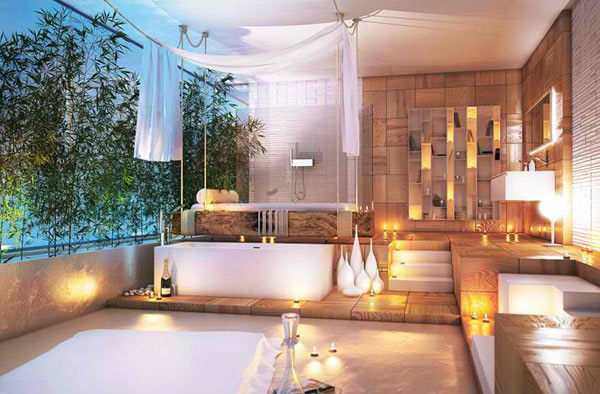 Who would not want to have a bathroom as lovely as the ones above? Well, MOMA Design has everything we need for a bathroom from furniture to fixtures. And the result of combining all the beautiful products from them is the bathroom spaces above. Your dream bathroom would be realized with MOMA Designs. The bathroom designs above could also be perfect inspirations for your own bathrooms too.